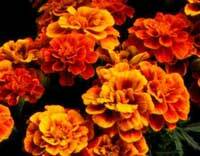 Marigolds as summer garden flowers have probably undergone more changes than any other group of plants. Today, they range in color from clear yellow to golden yellow, orange to burnt orange and many variations in between. Just as significant as color is the height - from 6" up to 3'- 4'. The names are just as interesting with names such as Dainty Marietta, Janie, Boy-O-Boy, Honeybee, Queen Sophia, Moon Shot, Apollo, Lemon Drop, Sparky, Queen Bee and many more. 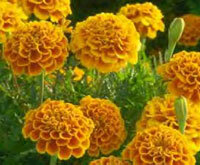 Marigolds require full sun and grow best in a loose garden soil with plenty of organic matter or humus. Even though you may see them growing in the worst soil possible, results are never as good as they could be. Prepare your flower beds by adding 3" - 4" of pine bark, peat moss, manure or leaf mold. On heavy clay, mixing 1" of sand will be beneficial. Add a very light application of fertilizer - one pound of 8-8-8 or 10-10-10 per 100 square foot of bed space. For pots or planters use 1/3 soil, 1/3 peat moss or manure, 1/3 sand. Marigold plants are more often purchased as young transplants in peat pots or trays or packs. They can be easily started from seed, however, if you save seed from last year's plants they will not be true to the variety since most marigolds are hybrids. The best planting time is after the last frost has occurred. This is generally after the first week in April. If transplanting from trays or packs use a knife to cut blocks of soil with each plant to avoid roots loss. Plant each plant slightly deeper than it was in the pack. Water thoroughly to settle the soil around the roots. Keep a close check on water during the first 10- 12 days. After that, a thorough watering once per week should be adequate. Be sure to remove the old flowers as they fade for continued bloom and neater plantings.